Don't completely refinish your wood surface if you don't have to—restore it with the simple wipe-on, wipe-off process of Howard Restor-A-Finish! Penetrate faded lacquer, shellac, or varnish finishes and bring back the original color while blending out white heat rings and water marks. Quickly blend away sun fade, oxidation, smoke damage, and most other blemishes to bring new life into old wood finishes. And don't forget to polish and preserve all your wood surfaces with Howard Orange Oil wood polish! 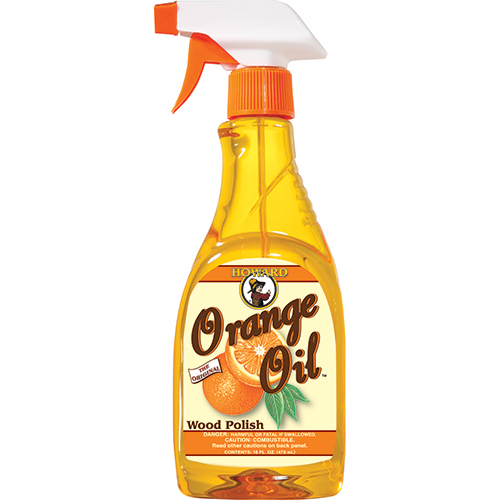 It's perfect for weekly dusting, and will keep those wood surfaces in great condition. CS Hardware offers a selection of wood care products to keep your home looking great! Restor-A-Finish, Specify Wood Color in 8 or 16 oz. You’ll never have to give up on any wood surface with the selection of wood care products from Custom Service Hardware. You can be sure to save and restore almost any wood surface, especially with Howard Restor-A-Finish. This product can bring back the original color by penetrating faded lacquer, shellac, or varnish finishes and can blend away many blemishes.